And here we have a messy, book-filled surface. I think I did a post similar to this one a few months back, but if you have no clue what this post is about, I'll basically be listing a couple of things that I'm "currently" up to. Although I'm not including revision… I don't want my horrible revision guides to mess up all the perfect bookishness! I was sent both of these books for review and, whilst I've hardly made a dent into either of them, I can say that I've enjoyed both the openings. A Delicate Truth is basically an espionage novel whilst Decoded is about a mathematical, code breaking genius who works for China's Secret Service. They both sound incredibly exciting! 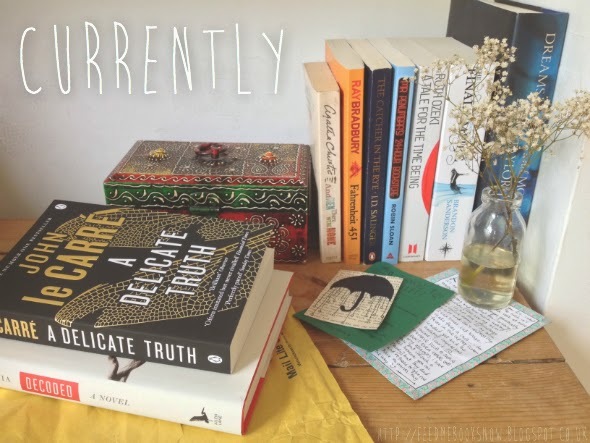 Currently I'm using… my TBR box! I don't know if I've mentioned this before (I don't think so?) but if you look to the back of the photo, you can see my TBR box. I've only started using this recently, but what I mean by 'TBR box' is that I've written down loads of books from my TBR pile on separate pieces of paper and put them in the box so I can pick out my next read. I've gone through roughly seven different reading phases during this past year (as demonstrated by the books) and they go roughly as follows: detective novels, classic dystopians, modern classics, books about books, books about different cultures, high fantasy and beautifully written novels. As you can see, I picked Dreams of Gods and Monsters to demonstrate my current obsession. I don't know what it is, but if a book has beautiful writing then I'll probably enjoy it right now! Currently I'm loving… handwritten letters! I mentioned this in my April wrap up post, but I'm kinda obsessed with the letters Hawwa (from It Was Lovely Reading You) has been sending me. I've had so much fun replying to them and it has definitely made me want to send more letters! In fact, once my exams are over, I'm going to send a whole load of handwritten letters to other bloggers because they are just SO FUN. DREAMS OF GODS AND MONSTERS. <3 i want to start reading more books that have more depth to them if you see what i mean? non-YA. give meh some recommendations. i saw Life after Life and The Luminaries when i went shopping on Saturday but i couldn't buy them because i had no money. :( Should i try and get them from the library? My TBR box has been fairly useful so far… although I'm normally a mood reader too so I don't know how long it'll last! Oh gosh yes!--writing letters is so much fun and super cute way to keep in contact. ^^ I loved it when me and my friend wrote letters because she didn't have a cell and was rarely on the internet and she was the most amazing drawer and she would write and draw these cute stuff. <3 The only complaint I have over letters is the shipping, it cost a lot even if it's instate and costs much more out of state. Hehe. :) And YES YOU MUST! Love your idea for a TBR box! I love to write letters too. I always hand write thank you cards and it seems that no one does that anymore. Sad actually. I have the worst handwriting you will EVER see but who cares! Ooh I love handwritten letters! My favorite things that have been sent to me by other bloggers are usually letters or cards. It's like, even though you know you can communicate online and become friends through that, it's something special when they actually go out of their way to write something and it's a physical thing you can hold onto. I really like it! Ah, I love writing and receiving handwritten letters! I used to have a couple of pen pals and although I'm not in touch with them anymore, it's definitely something I'd take up again. I adore physical letters are very genuine, but it is often hard to want to pay postage. My favorite part is seeing and comparing different handwriting. My own handwriting is somewhere between my Mother's and Father's. A TBR box wouldn't work for me as I'm too impulsive about which books to read and usually just pick one up.